The August summer flowers are filling the borders. Furthermore the leaves on the Amelanchier alnifolia Obelisk have started to turn to burnished gold. There are pink berries from the Sorbus vilmorinii and red ones on Berberis thunbergii f. atropurpurea Rose Glow. Moreover there are little green crab apples forming on the Malus Red Sentinel. In addition there are also small inedible pears forming on the Pyrus salicifolia Pendula. However I’ll leave those for another post as today it’s all about the summer flowers. Large photos: Cercis canadensis Forest Pansy with Potentilla fruticosa Red Ace in the background. Lavendula angustifolia Hidcote with yellow and red Hemerocallis (Artic Ice and Crimson Pirate) in the background. 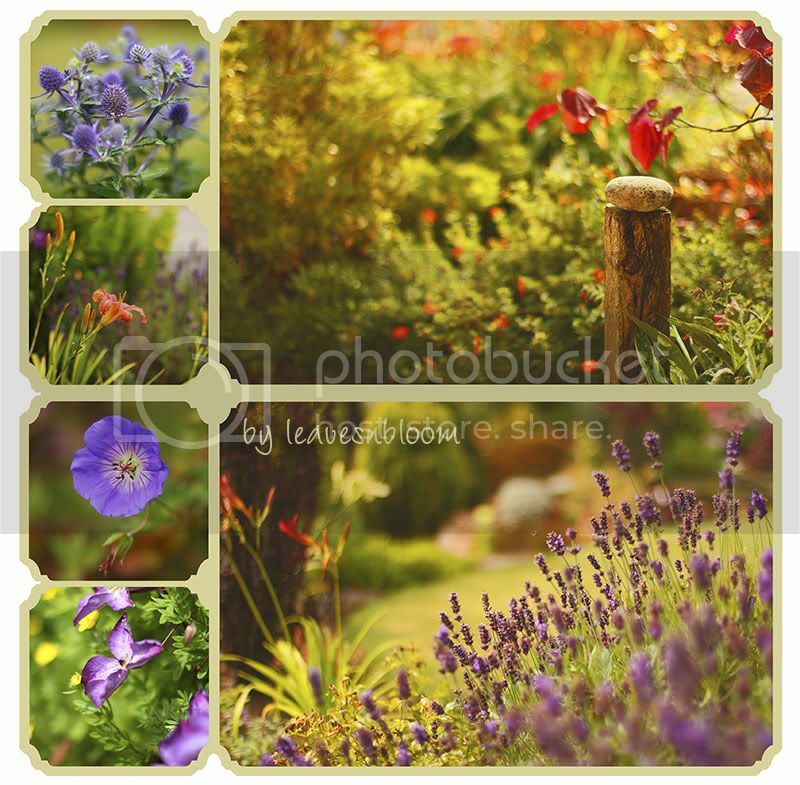 Smaller photos top to bottom: Eryngium planum Blue Hobbit, Hemerocallis Pink Damask, Geranium Rozanne, Clematis viticella Venosa Violacea growing along a yellow Potentilla hedge. Scottish wildlife sightings have been few and far between this year which is disappointing. In fact few butterflies have been visiting and I haven’t even seen a ladybird in the garden. Come to think of it I’ve only seen two ladybirds all year while out walking. I’m an organic gardener so I suspect that our awful weather in late spring has affected their numbers. Large photos: Spiraea shirobana Josephs Coat and Eryngium bourgatii Picos Blue. Small photos top to bottom: Prunella vulgaris, Diascia, Stachys lanata, and Allium schoenoprasum. Large photo: Carlina acaulis. 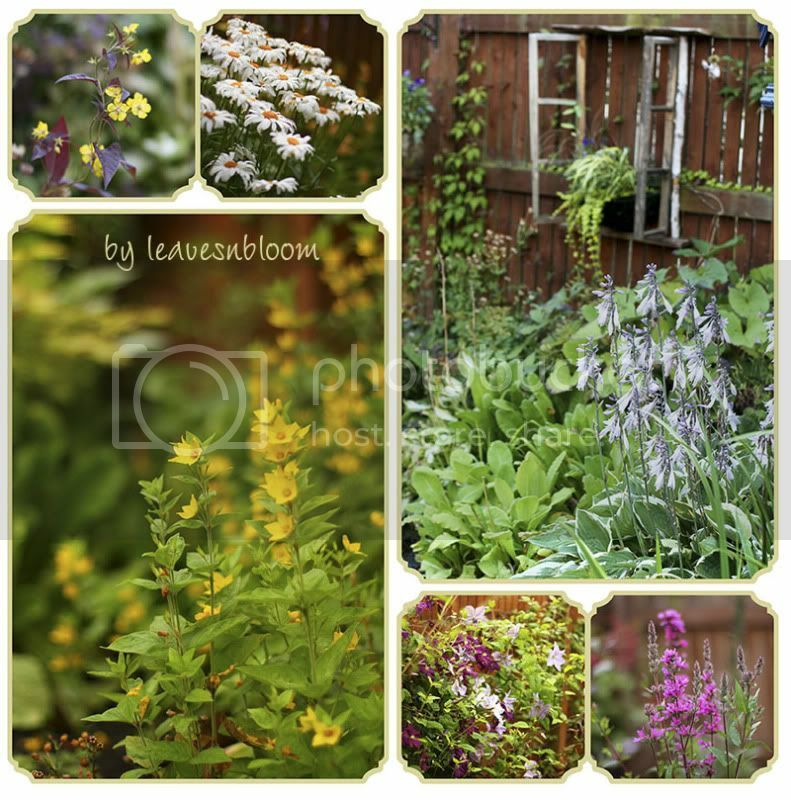 Smaller photos top to bottom: Thymus, Hydrangea paniculata Limelight, Oestospermum. Slugs and snails don’t seem to be a problem as there are about 20 adult newts somewhere I hope in the back garden along with a baby toad. They seem to be doing a great job at keeping the pest populations under control. 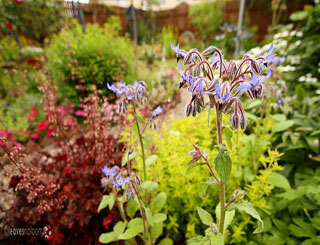 Below is a set of photos from my problem area – a border that I have lost so many plants over the years. I grow late flowering Clematis in a dryer part of the ground and train the stems to wander over by the wet area to give me a little more vertical colour at this time of year. 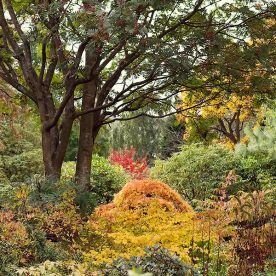 Consequently t’s a hard part of the garden to look good at this time of year. Indeed if I’d known years ago of how bad the water table was I would have built high raised beds up against the fence. But in those early days of the garden we were not getting the same amount of wet weather. Large photos: Hostas and Lysimachia punctata – seriously don’t grow this plant – it’s horrific and I can’t get rid of it now. I’ve just had to embrace the plant and try to keep it within bounds. Smaller photos: Lysimachia ciliata ‘Firecracker’, Leucanthemum (slightly dryer conditions where they grow), Clematis viticella Etoile Violette and a lost label Clematis, Lythrum salicaria. I wish Scottish weather was kinder to the daylillies. 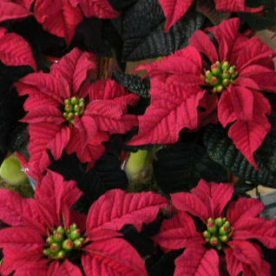 Consequently I have 2 varieties that are not in flower this year – ‘Prairie Night’ and ‘Strawberry Candy’. I also forgot to add a photo of ‘Artic Ice’ as it’s in flower at the moment too. 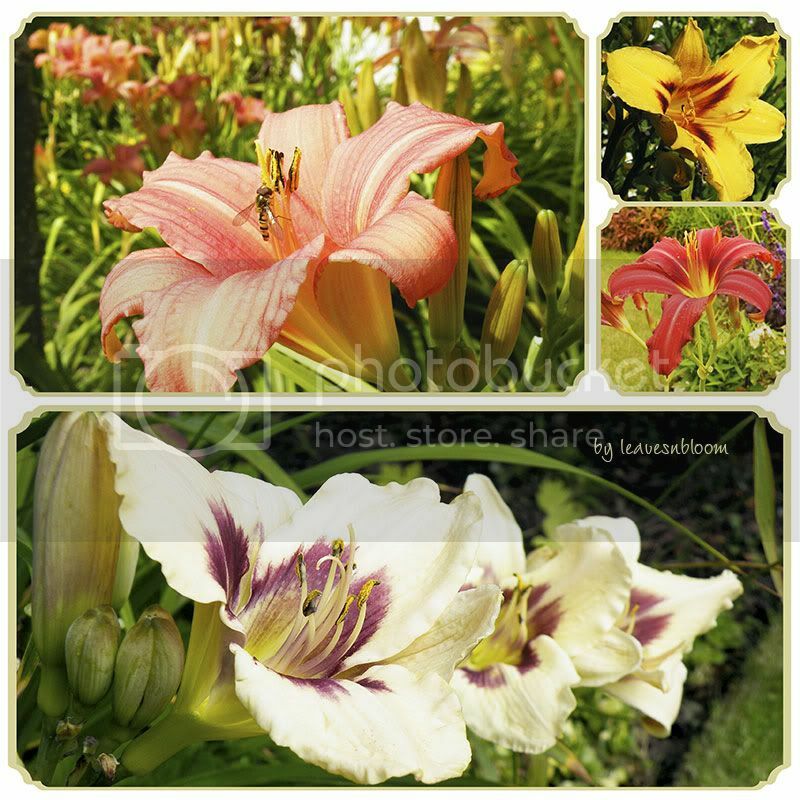 Large Photos: Hemerocallis Pink Damask, and Hemerocallis Moonlit Masquerade Smaller Photos top to bottom: Hemerocallis Bonanza and Hemerocallis Crimson Pirate. Large photo: Buddleja Leela Kapila, geraniums and potentilla. 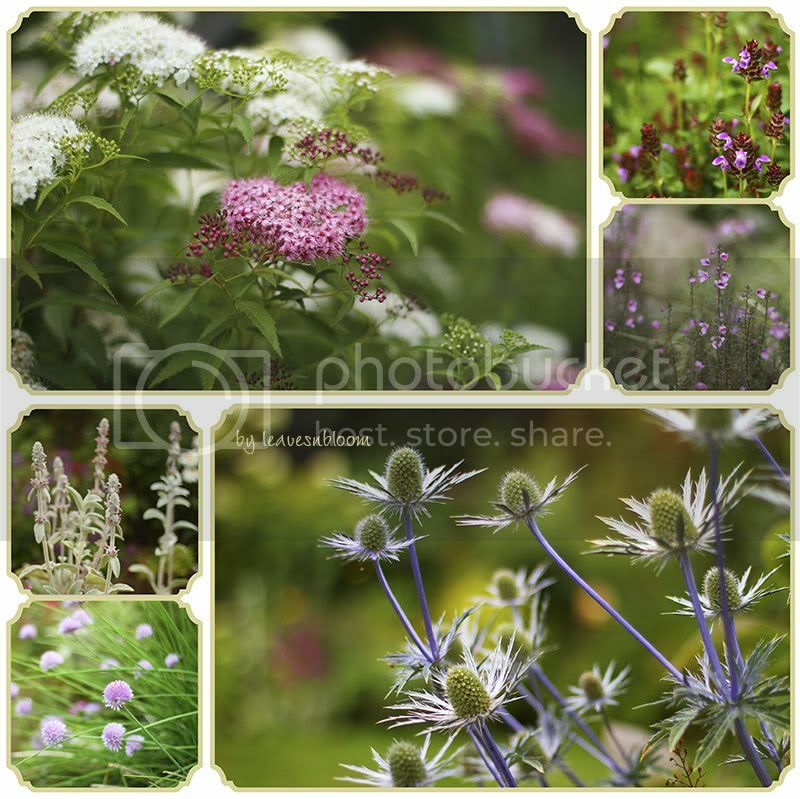 Smaller photos: Astrantia and oregano. 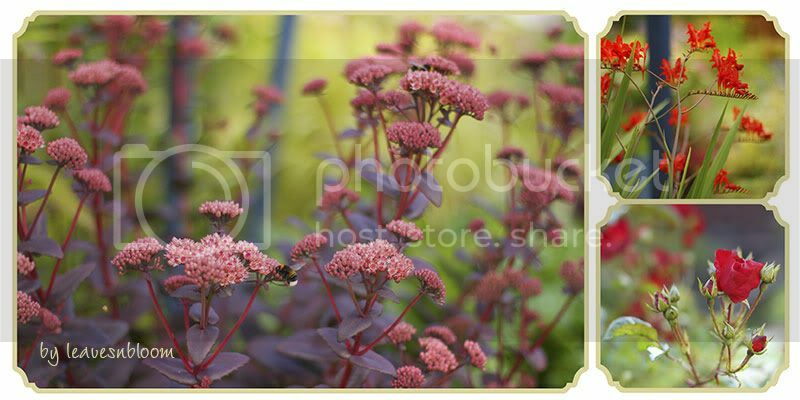 Large photo: Sedum telephium (Atropurpureum Group) ‘Purple Emperor’. Smaller photos top to bottom: Crocosmia ‘lucifer’ and a standard flowering carpet rose. Finally I’ve also plenty of daisies in the garden … see my post on Anthemis tinctoria Hollandaise Sauce. 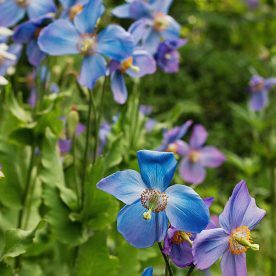 What’s in bloom in July? There's beauty everywhere in your August garden. Each collage is gorgeous, but I do so love the one of the Daylilies and Sedum/Crocosmia/Rose shots. Your problem area looks fantastic and the Clematis do look so good. I also just adore that burgundy Osteospermum! It was such a pleasure visiting again today. As usual beautiful flowers from your garden. The weather has been horrible here. Too much rain in my opinion. Today the sun is shining but still a bit windy. I haven't seen many bees or wasps either, think it must be too cold for them. Excellent post! 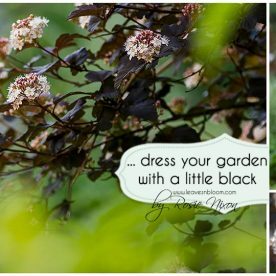 It is a rainy day here in the northeast and I am just taking in all the beauty that is in your gardens. 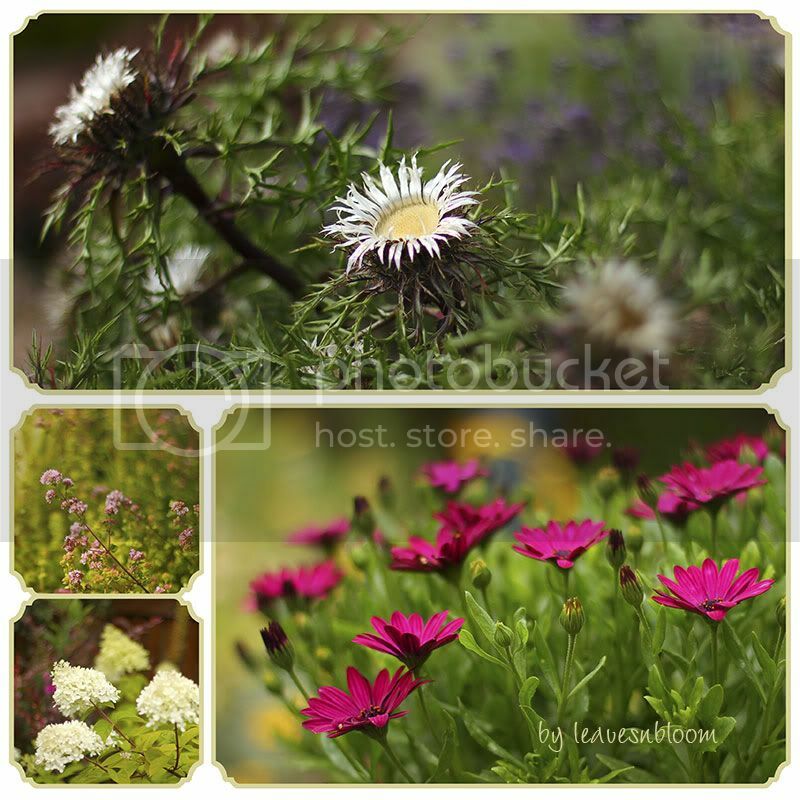 Your photography and collages are beautiful! beautiful garden! well done on the collages also. Enjoyed your August flowers Rosie. I think that the ladybird population is thriving but in the south east this year. Have been picking apples in East Anglia this weekend to discover clusters of ladybirds snuggling round the stalks ~ must be a good place for a snooze. Hope that they return to you next year. Beautiful photos. Such lovely flowers, and a great variety of them. I've noticed just a hint of autumn lately, too. Wow, your flowers are just stunning. Your August garden is beautiful. Love the photos and the mosaics. A great post. Everywhere I look there are beautiful flowers in your garden. The daisies are so inviting. Rosie, another fine tour of your gardens. I enjoyed the colorful visit. Your images are wonderful as always. Happy GBBD. Your photographs are really beautiful. My favourite view is the one from your kitchen window! Wonderful photos as ever, – I think your herb is an oregano. Goodness, you have a LOT of plants in bloom at the moment. We're steadily reverting to the greens and browns that are so common here in late summer as most of our natives go dormant. If it wasn't for the lavender, thyme, oregano, and the last of the blooming Penstemons, I think our bees would be bored! It's good to see your daylilies in bloom though. I have some in pots, and just as they started blooming, some creature came along and nibbled all the flower buds. I know it wasn't deer as that area is fenced…I suspect rascally rabbits though. So pretty. Your garden is a delight Rosie. OK, this post is fantastic, your photos are simply gorgeous!!! That first one says Autumn, doesn't it? It's nice to see you have so many blooms, my garden is winding down too. 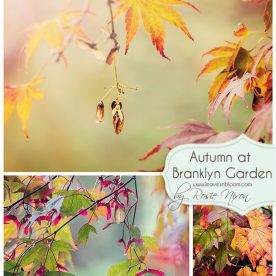 Dear Rosie, I love the way you have presented your photographs with beautiful 'frames' and text interspersed. Every bloom is gorgeous! I'm ready for a trip to Scotland …..
As always, GREAT photography! I think my favorite photos in this post are of the lavendar and the large photo of the view from your kitchen window. What a view! They are just so beautiful! I wish I had your talent (and education) as our yard looks more like the desert. Maybe, one day a passion will arise and I will learn and cultivate the ground the Lord has given me in ways that are beautiful. Rosie, I always thoroughly enjoy seeing what's in flower in your garden. I also remember moaning about the weather last Summer but this one has been even worse, I am amazed that the gardens can still look good. what a beautiful garden you have!! Hello Rosie, i missed your posts! How are you? Your collages especially those elaborate frames very well matched the lovely photos. 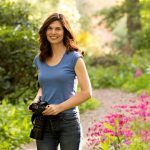 They made the flower photos more special, as in classic gardens. I most especially love the topmost large photo composition. I wish to do something like that too, amazing! thanks. SO much beauty and most of it is new to my Australian eyes. You have the most amazing garden!